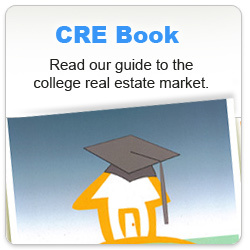 Welcome to CollegeRealEstate.com, a resource for anyone that is interested in the buying and leasing markets surrounding university campuses. We hope to provide current and relevant information about market trends, investment opportunities, local industry experts, and the latest news for most major universities in the United States. 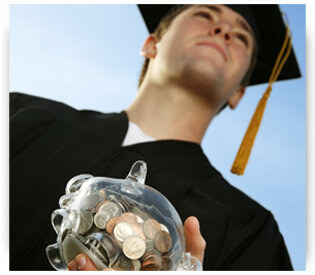 We believe that campus area real estate is a very sound investment and can help to offset a portion, if not all, of your student's college education as well as provide a safe asset for your portfolio. 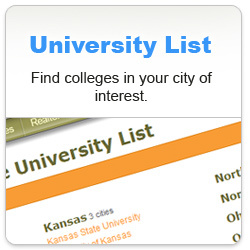 Take some time to find out why by reading our weekly real estate blog, flipping through our free online College Real Estate Guide Book, and checking the current trends in your campus town. 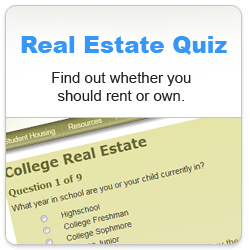 We have also included a free College Real Estate Quiz to help you determine if this market is right for you. We are constantly expanding so check back often for more campus additions and additional resources.